Business documents are vital strategic, financial, operational and intellectual assets that are essential to daily business processes. They constitute the lifeblood of an organization. Yet, half of all companies rate their document management practice as less than effective. Corporate accountability, regulatory compliance and the need to communicate with customers drive the increased importance of documents. Each day, a company’s knowledge workers create, distribute, print, store, access, share and archive thousands of documents. This proliferation creates a compelling need to ensure that documents are efficiently controlled and managed. Effectively managing document assets throughout the complete lifecycle enhances business performance and proactively insulates against risk. 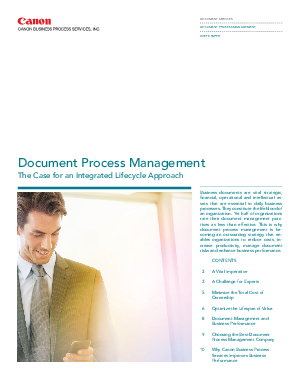 This whitepaper looks at how to minimize costs related to document process management; how to choose the best document process management company to meet your firm’s business objectives; how the integration of technology, processes and people help firm’s seamlessly manage documents throughout their useful life span; and how to maximize the utility of documents as a critical business asset and minimize document related risks.